Last weekend kicked off the start of our soccer season. After school, I took Cute to the store and let him pick out his own soccer gear. I directed him to the correct sections, but this was all his choosing. I had to bite my tongue on the fact that nothing really coordinates. 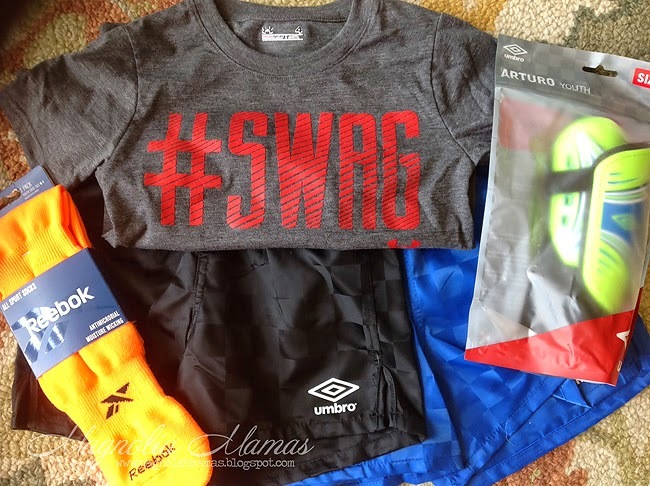 Or the fact that the #SWAG shirt wasn't really what I was picturing as appropriate soccer practice attire for an almost four year old. But who am I to stand in between a boy and "the best soccer shirt ever seen!!!"? I control all of his daily wardrobe choices still with out a peep from him, so I was happy to let him pick whatever he wanted. Besides, they don't make seersucker Umbros. Do they? He was so excited to start soccer that the morning of he woke us up bright and early. Seriously early. Like 4:45a.m. early. It didn't start until 10a.m. Once we got there he was even more excited they let him pick out his very own ball. With a quick hi-five to the check in lady who gave him his ball, Cute was off and he became a man on a mission. A mission to score goals. It was adorable. My husband and I stood back taking a million pictures of all that adorableness. 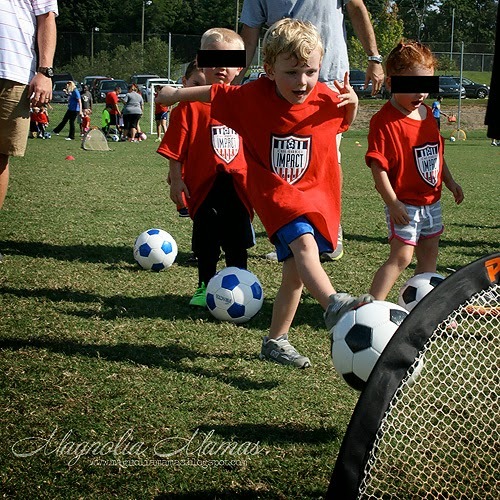 Then the coaches and helpers called us over and informed us that the first part of the session is parent lead, and we will have to help them run drills. Holy moly. I will tell you what was un-adorable. This mama running drills along her super fast four year, while carrying her ten month old daughter (who consistently hits the 98 percentile for height and weight), during the hottest weekend of the summer. Trust me, there will be no sharing of that adorableness. He had a blast though, and we couldn't have asked for more than that. Well, maybe for that and a huge bucket of ice water. Our weekend fun didn't stop there. We headed to the Atlanta Zoo for members only night. It was a great event, and The Cutes were so amazed with all the animals and special exhibits that we let them stay up waaaaaaay past bedtime to enjoy as much of it as they could. Hubs and I enjoyed it too. The Rhino exhibit was my favorite. Mommy Rhino was trying to enjoy her last snack of the day before lights out, and Baby Boy Rhino was just running around getting his energy out. It became all too real when Baby Boy Rhino decided he was bored and started poking at Mommy Rhino when he wanted a playmate. She was making it known that she wanted five minutes to herself to finish her meal. Baby Rhino did not want to be patient and responded with that by sticking his Rhino horn where no Rhino horn should go. Oh man. I looked around and locked eyes with a few other mommies watching the same scene. We all collectively knew what that would get you. That my little Baby Boy Rhino will get you an automatic time out. And then some. Monday rolled around and we started our weekly grind again. We all seemed a little sluggish from the weekends activities, but after nap Little Cute felt extremely warm. I took her temp and called our pediatrician. We did a few tricks and watched it for a few hours and nothing changed. Her temp stayed around 104 degrees and it was concerning so we headed to the ER. This would make ER visit number four for this family in two weeks. Our insurance company loves us. We must have hit Children's at its busiest. We waited about three or so hours to be called and another two or so to be seen/diagnosed. Little Cute was a trouper and was happy to sit in my lap the whole time and wave at everyone around her. I didn't mind too much either especially when we saw how many super sick little ones kept walking through the door (or sadly, not walking). Final diagnosis was just a fever. I will take it. I hate seeing little ones so pitiful. With all that time spent in ER waiting rooms, I got caught up on some reading. 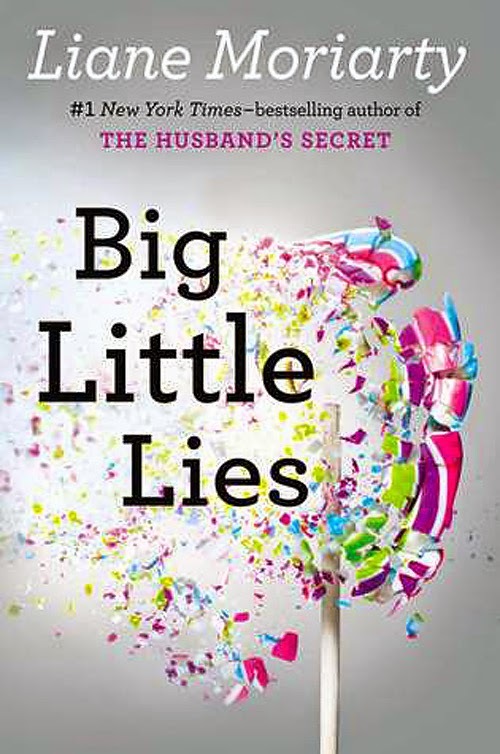 This week I was able to finish Liane Moriarty's Big Little Lies. It was a great fast paced read, and I would highly recommend. I am definitely looking forward to reading more by Moriarty. 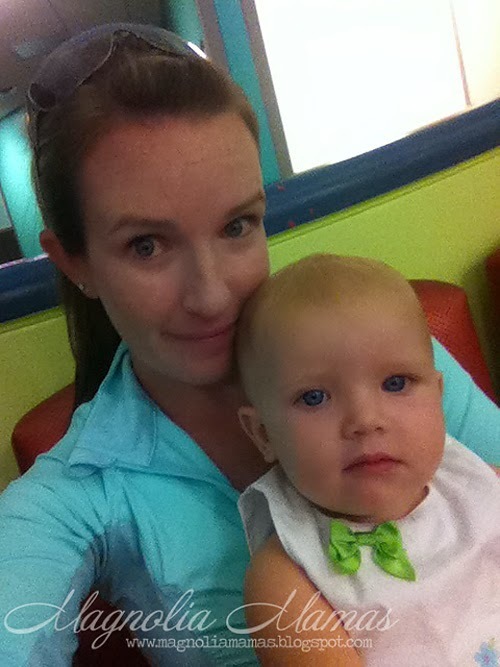 To close out my week, I had a most fun breakfast and shopping date with my now healthy girl this morning. 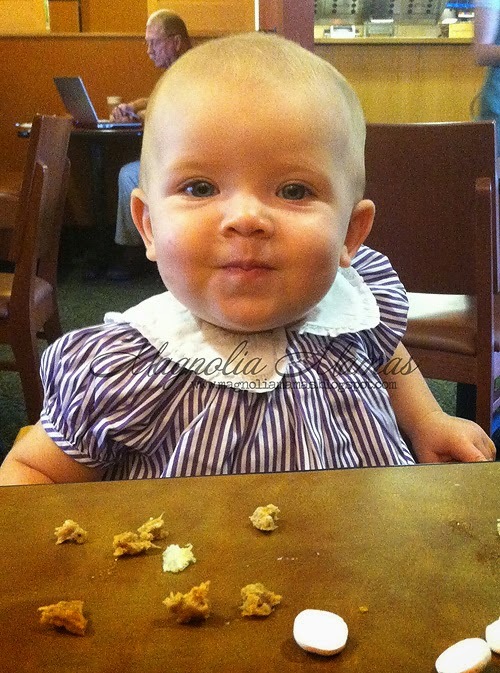 She fell just as much in love with Panera's pumpkin muffins as her mommy has. Yum!! And by the way people, that's not just a Fall love. Pumpkin muffins at Panera are a year round love. Yet one more reason I should be taking that C25K a little more seriously. Isn't she just adorable?? Bad cell phone camera lighting and all. Swoon. Now we are off to go pick up Cute from school and celebrate the beginning of Fall Break right. With Chickfila milkshakes. I should totally run more.